Nevada Girl recently wrote about Reputation wherein she stated her predilection for breaking wind and blaming her boys, when actually she’ll blame anyone near her, including her dogs. (Sometimes, oddly, both at the same time.) I’ve also seen her blame a mall santa and a frozen chicken in the meat aisle at Scolari’s. Oh yes, she does have a reputation. Anyway, as a salute to her, I give you a few more musings on Reputation. First, please note Briter’s Corner now features Briter throwing up in the toilet after a night of drinking. This is his most viewed photo–and so a reputation is made. Now, each morning we dutifully listen to this ditty by Merigail and Don Moreland about how hard a good reputation is to make, and how easy it is to break. I got this from one of my favorite places to get music, WFMU’s Beware of the Blog. I was once arrested for being a minor in a nightclub. A disco club, in fact. Did a few hours in the hoosegow, as they say. It affected my reputation for sure, because now no one will let me forget I paid a hundred dollars for the worst fake ID ever. I was disappointed I didn’t get a mugshot, though. You can bet I’d have a copy in my wallet if I did. Guess my Crime is a site to see mugshots of people who may have ruined their reputation and your challange is to guess how they did it. Reckless Endangerment or Controlled Substance or Speeding? Another way to blow your rep is to have a photo in the high school yearbook that pretty much affirms you are a weirdo. I have such a photo in mine, and I’m not a big fan of it. You’ll have to ask Nevada Girl for details. Sadly, my photo is far worse than that of this poor girl at her science fair. (Mosquito larvae beware, indeed.) 40 other regretful photo memories can be found at the 41 Hilarious Science Fair Experiments site where many young adults will have their reputation forever tainted. 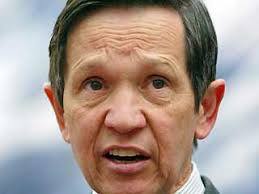 And finally, here is a picture that will forever reflect on Mr. Brenda’s reputation. Don’t ask. For Valentine’s, The B-Man–by way of a delightfully clever puzzle-card he made–invited me to a dinner at a fancy-shmancy vegan restaurant and I mean shmancy! Thank you, Love! Every Sunday closest to the full moon, Millineum restaurant offers up an aphrodisiac dinner with ingredients considered to have romantical qualities and effects. The five-course meal is even finished with a Chinese herbal love potion! It was delicious and you know it was romantic because the menu was in French. As are most exceptional dinners, it was a little pricey and the question I always ask is: why is vegetarian food so expensive? The answer: the government subsidizes the meat industry! I direct you to this informative page which explains why a salad costs more than a Big Mac. Wow, with all that money we’re giving them, you’d think the Meat Industry would try harder to keep the e. coli off our tables. I’d like to begin a new semi-regular thing this week called The Weekend Dump wherein I deposit all the cool things I’ve run across on the Net in one nifty little package. It’s a time for new beginnings what with the Chinese Lunar Near Year happening. It’s my year…year of the Rat! I know–who wants to be associated with a rat? The B-Man’s lucky; he’s year of the Dog. Anyway, Gung Hay Fat Choy, everyone! Did you know Poloroid stopped making Instamatics? Sad, right? So, don’t expect to see stripper audition Poloroids like this Flickr set anymore. Many strippers pictured, none of them, my mom. Who doesn’t want more pictures of beautiful ladies? Nevada Girl has a fondness for old ladies and new babies, so I’d like to dedicate these high fashion shots of something-something genarians, to her. And finally, NO, this is not a picture of Nevada Girl in her teens, but something for our brother, Fadongus. 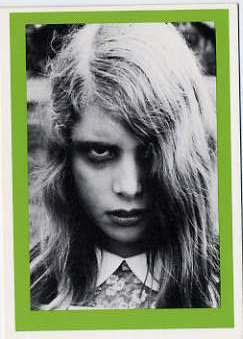 Night of the Living Dead bubble gum trading cards from deadalicious! Collect the whole set and scare your dentist. And with that Dear Reader, I bid good day! We returned from a wonderful visit to Solvang yesterday. 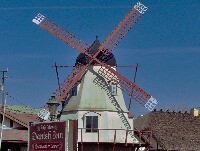 It’s a self-described Little Denmark-themed town in the central California valley and it is precious beyond words. I’ll write more when I get a chance, but I’ll start by letting you know I had the best dang cheese danish ever at Olsen’s bakery. 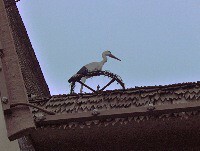 Also, the town is loaded with windmills and stork statues on rooftops. Thinking of you, Dear Reader, I dutifully took pictures of as many as I could. However, in reviewing them later, it turned out when you’ve seen one, you’ve pretty much seen them all. So, here are all the windmills and storks in Solvang. You’re welcome. Yesterday, I came home from work only to find my answering machine and email basket overflowing with exclaims of excitement heralding my return to the blogosphere. Honestly, I was quite touched and thrilled about it all. I like writing these little letters to all of you and it’s nice to know they’re appreciated. The B-Man’s and my Valentine’s day was wonderful from beginning to end…the best I ever remember having! I’d tell you all about it, but since I gush about him so much it makes some people want to puke. So, I’ll just say Briter was very sweet and made us chocolate fondue but we didn’t have any, because, you know, Briter made us chocolate fondue. ‘nuf said. 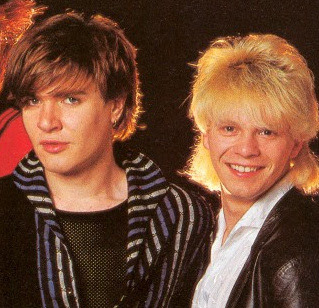 We’re off to Solvang this weekend, but before I say good-bye, you should know there’s a very funny Happy St. Valentine’s Day surprise waiting for you at the “Men Who Look Like Old Lesbians” blog. 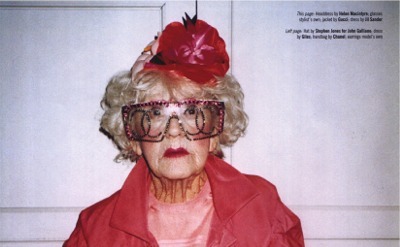 If you know a lot of old lesbians like I do, it makes it even funnier. He said “I miss your writing” and I thought no one had ever said “I love you” better. First, if you find yourself down in Southern Nevada and run across a space ship in the desert like The B-Man and I did, and start taking pictures, do not be surprised if some scary Army guys come up and take your camera away. 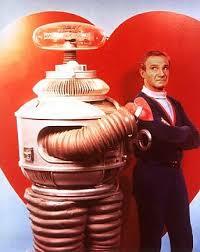 Also, they will not find your impression of Dr. Smith from Lost in Space the least bit funny. Anyway, for secret government reasons, I can’t share much about that particular incident, but, I for one, welcome our new insect overlords. I also can’t tell you much of what Mr. Brenda’s been doing during the interim, either…for legal reasons! He won’t even tell us! All we know is he says he’s under house arrest and has to wear one of those ankle bracelet things. He’s been gluing rhinestones all over it trying to make it look more like Paris Hilton’s cell phone. It looks pretty good except for where he burned his leg which is why you shouldn’t use a hot glue-gun if you’ve been drinking. And there you are, Dear Reader–all caught up with the events here! I want to wish you all a Happy Valentine’s day, too. You don’t need to go out and buy expensive gifts for your honey; there are many ways to show how much you love him, like saying you want him to start writing again. Hey, Mr. B-Man, I love you! Will you be my valentine? 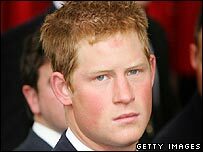 So asks the BBC News and reports on the state of redheads in England which sounds like a total bummer. I grew up hearing only a few taunts about my hair (which used to be really orange) but they had no sting.You should know “carrot-top” is the lamest thing ever to call a redhead since the tops of carrots are green and have leaves. Why not just call me a “carrot?” You’re not insulting me, you’re just embarrassing yourself. Carrot-top, copper-top, ginger-nut, ginger minger, bluey (among Australians), Duracell, Ronald McDonald, Simply Red, Queen Elizabeth. And so on for hours and hours of the typical redhead’s life. The Australians are predictably cryptic and I’d consider Duracell a compliment. And oh, what wouldn’t I give to be called a ginger minger on the way to Reno on a crowded Greyhound bus! The mind boggles at the thought. The article makes it sound like our British cousins have it much worse over there. They envy redheaded women in the USA who are seen as “alluring, beautiful,” and “glamorous” which, funny enough, are the same words used to describe my sister, “Nevada Girl,” so it must be true. The whole article is a fascinating read and full of interesting theories and opinions about redheads such as we bleed more but also have a higher tolerance for pain. And it’s all caused by a mutated MC1R gene! “Ginger minger mutant!” THAT’s the dream insult I’d like thrown my way!